Sealaska Heritage Institute (SHI) will host a pop-up boutique in Juneau featuring pieces from popular designers of fashion inspired by Native designs. The event is a rare opportunity for people to shop fashions directly from designers who will be featured in SHI’s upcoming Tináa Art Auction Native Fashion Show. “You might have seen these designers featured in fashion shows, magazines or online. Now is your chance to meet the designers and try on their work prior to our Tináa Native Fashion Show,” said SHI President Rosita Worl. The event will include designers Dorothy Grant, Pamela Baker and Crystal Worl and feature jewelry, high fashion gala dresses, leggings and shirts that celebrate and support Native style. Designers also will be taking custom orders. The event is scheduled from noon-6:30 pm, Thursday, Sept. 28, at SHI’s Walter Soboleff Building lobby in Juneau. It’s free and open to the public. Everyone is welcome. The pop-up boutique precedes the art auction and fashion show, which is scheduled Friday, Sept. 29 at Centennial Hall. 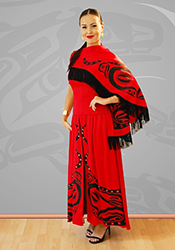 Internationally renowned fashion designer and Haida artist Dorothy Grant’s strong connection to her culture and Haida identity has been the driving creative force and her foundation as a fashion designer for the past thirty-two years. In 1988, Grant became the first to merge Haida art and fashion utilizing her formal training at the Helen Lefeaux School of Fashion Design. Grant’s recent achievements include dressing Duane Howard, aka Elk Dog, in the movie “The Revenant” for his walk on the 2016 Oscars Red Carpet. Her last award was the highly esteemed Order of Canada, which is a recognition for her contribution to the fashion industry in Canada and her work as a mentor to youth. Pam is from Kwaguilth ancestry on her mother’s side, and from Sqaumish ancestry on her father’s. Many years ago, Pam began a lifelong search to provide First Nations people a stage to showcase their culture. As a single mother, she moved her two children down to Los Angeles, California, to study at Otis College of Art and Design where she obtained her degree in fashion design. Her newly acquired degree provided her with the technical skills and business acumen to focus her efforts on designing a future that would honor her ancestors. In order to develop a viable long-term business that included employing First Nations people, she started creating her own unique fashion and jewelry with First Nation designs. It was then that Touch of Culture was reborn as TOC (Touch of Culture) Legends, and most recently she founded Copperknot Jewelry, all locally made. Crystal Rose Demientieff Worl is Tlingit Athabascan from the Raven moiety, Sockeye Clan, from the Raven House. She is a child of a Thunderbird and from the Chilkat region in Southeast Alaska. From her mother’s side, she is Deg Hit’an Athabascan from Fairbanks Alaska. In 2013 Crystal earned a bachelor’s of fine art in studio arts from the Institute of American Indian Arts. Crystal experiments with printmaking, painting, and silversmithing. She recently began working with fish skin, seal gut, and furs. Crystal studies traditional Tlingit formline design and Athabascan beadwork patterns. Her work explores the relationships and bonds between her people, the land, and the animals.